We will be updating our page with products in our Square Market. Trying to add items every day. Please ignore the pop-up ads as they have nothing to do with our products. Also working on a paid site that won't have the ads! We carry a wide variety of rovings in natural and hand dyed colors. 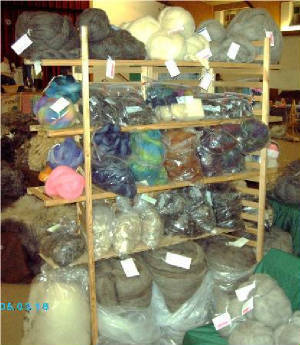 We have 100% wool and wool/mohair blends. All of the fibers are EXTREMELY WELL skirted before being sent out for processing. 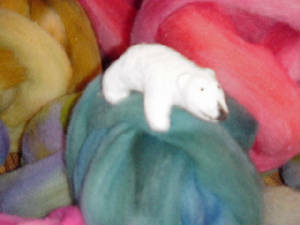 The rovings have very little or no vegetable matter and are easy to spin or needle/wet felt with. All of our processing is done at Zeilinger's in Frankenmuth, MI. Looking for the rainbow and beyond in colors? We have a large variety of hand dyed rovings. Many of the colors are one of a kind done from over dye pots from several different colors. 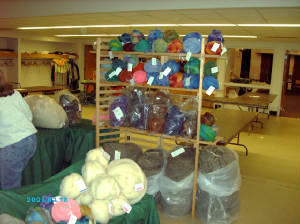 Most of the dyed rovings are done in very small portions so if you see something you like, you may want to take it all! Check back often to see more new blends. Our home grown handspinner knows what she likes when she feels it. She carefully selects the wool that she blends with the mohair raised on our farm. Knowing the goats like she does, she can pick and choose the wool to her liking. She tends to go on the soft side for next to skin rovings due to her fair skin and red hair. Whether colored or white, dyed or raw, you can count on only the best fiber being used. There are never enough hours in the day so taking extra precious minutes while you're spinning to pull out "leftovers" isn't my idea of time well spent. Skirt it well from the start to be able to enjoy your spinning time! !